Mercoledì è il compleanno di mamma Emma... così le ho preparato questa card. Ho utilizzato anche qui due volte lo stesso timbro: prima per creare lo sfondo con l'inchiostro oro e poi colorando lo stesso soggetto con i pennarelli spectrum noir per decorare il davanti. 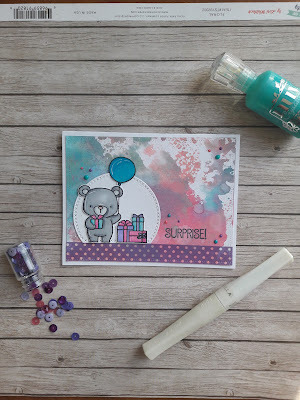 In this Card I use the same stamp for made the background and after that I use this roses for the main subject coloring it with spectrum noir markers. this is a lovely card, I really love the colors and your beautiful flowers. 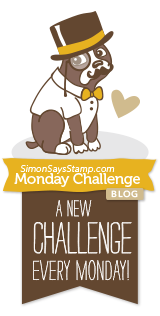 Thank you for joining the challenge this week at the Simon Says Stamp Monday Challenge Blog! Such a beautiful card, the roses are stunning. 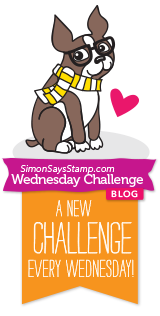 Thanks for sharing your wonderful creation with us this week at Simon Says Stamp Wednesday Challenge.